As we pursue truth, let us also pursue love. Sunday night, we’re looking at Revelation 2:1-7. Join us. God is generous. As Paul lists out all that God has planned, worked out through Christ and given through the Spirit, I am overwhelmed by God’s generosity (freely gives, according to his pleasure, because of his glorious grace) that is to our benefit and His glory. It’s my hope that we (me too) will see God’s generosity as the pattern for our (my) own generosity. We have every spiritual blessing in Christ. If you are “in Christ” then you have it all. Not some, not part, not a chance of getting a little more… you have everything. Upon trusting in Christ you can know that you have been chosen, adopted, redeemed, forgiven, let in on the purpose of the whole plan, sealed, and given a down-payment guaranteeing and giving a taste of the full inheritance (ie dwelling with God). And all these blessings are only found through Christ Jesus. Good doctrine leads to good praise. Paul had an incredible knowledge of God and what God has done… and he praised him wildly. The 202 word sentence of verses 3-14 is a rapidly growing snowball of theology and exaltation because Paul couldn’t separate the two. We shouldn’t either. Be thankful for other believers. It is a simple part of this chapter, but to me it speaks volumes: “ever since I heard of your faith in the Lord Jesus and your love for all the saints, I have not stopped giving thanks for you.” We too should be thankful for other Christians. Pray for other believers. Paul doesn’t stop at being thankful for them, he prays for them. He prays a deep prayer that fits exactly with their needs. And their needs are our needs. We need to know God and know His blessings. Sure, Paul tells us about God and he lists out the blessings, but his prayer is that the people reading would grow in their understanding of them and their direct experience of those blessings. This week I discovered a new function on our church copy machine: guided book scanning. Now, this machine had always had this capability, but I didn’t know about it, and I certainly hadn’t put it to use. Paul wants us to know these blessings (found in verses 3-14) and put them into use (because we already have them… all). God has power for those who believe. What kind of power? The kind of power that raised Christ from the dead and placed him in authority over everything. Power that shows we too will conquer death and will join as co-heirs with Christ. Even when we’d like to see more of God’s power working right now in the thing we need right now… we need to rest knowing that He has shown His power and taken care of the most important things of all (death and an eternal dwelling place with Him). I hope that you too are being encouraged and challenged by this great letter of Paul. Keep reading, keep praying, and keep expecting God to continue to work in you as you seek after Him. I don’t remember exactly how old I was when we made the road trip (10 maybe? ), but I do remember my tunes. It was during Christmas break and my family of four loaded into the suburban and made our way north to Washington and then over to Idaho to visit family for Christmas. What did I listen to in my Sony Walkman? My beloved MC Hammer tape, Please Hammer Don’t Hurt ‘Em. Take time today to go before the Father in prayer; He gives generously to his children. Here is a little video Robert Mayer and I put together to help give an introduction to Paul and the purpose his letter. Ephesians. Ephesians is a book (well, a letter) written by a man named Paul to the church in Ephesus. Of course, Paul used to go by Saul and as Saul, he wouldn’t want to write nice letters to the church. He was more of the “breathing out murderous threats (Acts 9:1)” type. Then Saul had a blinding experience that opened his heart to the truth of the Savior. Jesus changed everything. Now Saul is Paul, and Paul is preaching Jesus in the synagogues, the street corners, on top of hills and in homes. Nothing can stop Paul from telling people the Good News about Jesus. And he also writes letters. Lots of letters. To the churches in Rome, Corinth, Galatia, Phillipi, Ephesus and more. Paul writes to encourage, equip, inform and challenge the church to be the church. Some of the letters he wrote while visiting other churches. Others he wrote while under arrest for preaching the Gospel. Ephesians is one of these letters, dated to around 62 AD, while Paul was imprisoned in Rome. So once again, Ephesians is a letter written by a man named Paul to the church in Ephesus. Now Ephesus was big. Big in size and big in importance. It served as the capital for Roman Asia Minor and was a leading center of commerce. It even contained one of the seven wonders of the ancient world, called the Temple of Artemis. This actually got Paul in some hot water, stirring up a riot because his preaching was cutting into the lucrative idol making business – read more about that in Acts 19. But Paul’s letter, while given to the church in Ephesus, does not speak much to any local problems or situations. Some say this is because the letter was meant to be shared with many churches, not just those in Ephesus. Either way, we benefit, because Paul’s writing in Ephesians speaks clearly to the incredible work of Jesus and His incredible love for the Church… not just one church, but all who believe in Christ who make up the universal Church. It explains who Jesus is, what He did, and why it makes all the difference. 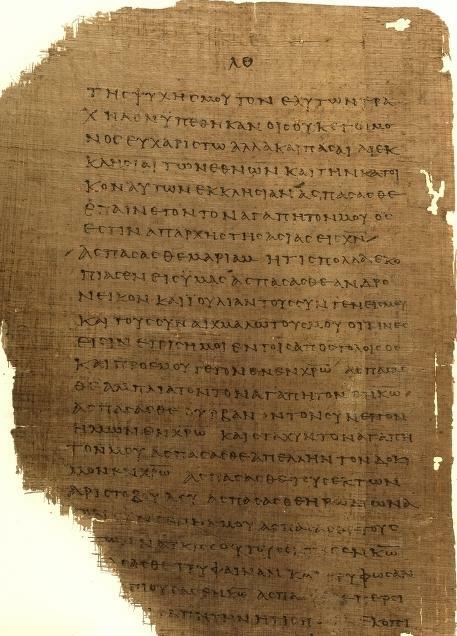 Ephesians: a letter written by Paul to the Church… about Jesus. To sum it up… Jesus loves the Church, to the praise of God’s glory. 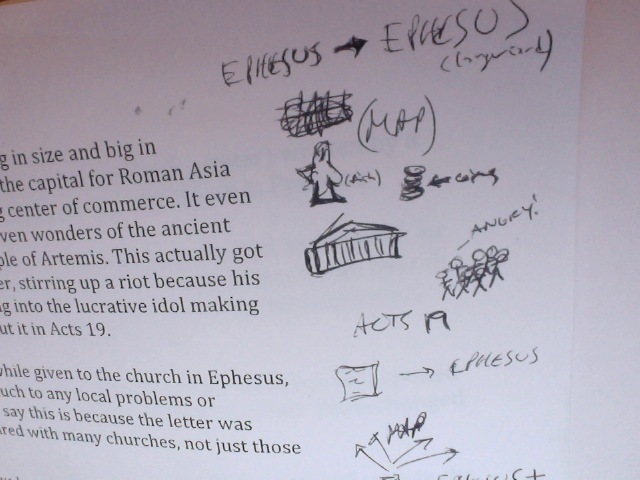 Why I think Ephesians was not to just Ephesus. This is why I didn't do the actual drawings on the cards... just concepts.